When you think of healing do you think of it being more than a physical matter? 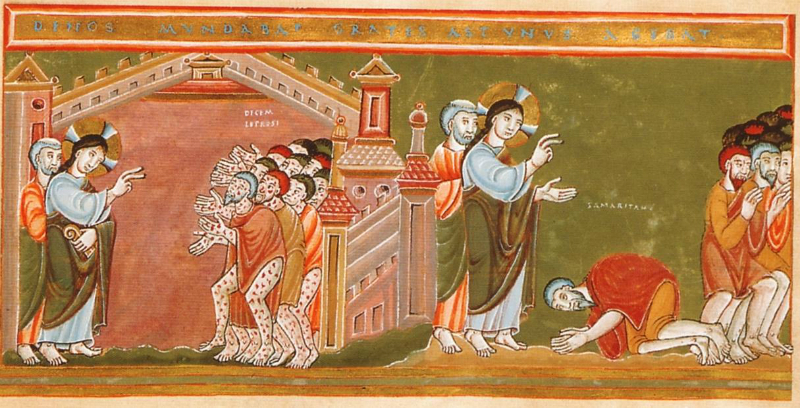 Ten lepers were healed. Only one expressed thanks to Jesus. Why only one? Is this the time to thank God for healing you have received? Lately at MLC we have emphasized living with gratitude. How are you doing with that? Readings are from the online Revised Common Lectionary, a project of the Vanderbilt Divinity Library, a division of the Jean and Alexander Heard Library. Scripture texts are from the New Revised Standard Version of the Bible, from the Oremus Bible Browser. Image Source: Art in the Christian Tradition, a project of the Vanderbilt Divinity Library, Nashville, TN.